For Duncan Hall, there is a comfort in knowing that his life’s mission, to offer compassionate health care to those in need, was inspired through witnessing the everyday struggles and challenges of his sister's battle with cancer. Hall, who is a longtime Macon resident is a nursing student at Georgia College & State University in Milledgeville, Georgia. He is in his first year nursing cohort at the college's School of Nursing and will graduate next May. But before he graduates, Duncan has been given a "humbling opportunity" to travel abroad to the Philippines for two weeks this summer to practice as a student nurse providing care to the inhabitants of the island of Bohol. According to Dr. Steve Dorman, President of Georgia College & State University, “The opportunity to study abroad can be a life changing experience. Not only are students challenged to engage with other people and learn about their cultures, languages and customs – but traveling to other countries allows students to develop skills that will enhance their future employment prospects and enrich their lives." Duncan will have the once-in-a-lifetime opportunity to provide healthcare to the population of Bohol, which operates a privatized system of healthcare that is very expensive for the island citizens. Once in the Philippines, Hall will be screening Bohol's adult population for chronic conditions as well as investing his time with orphans at local orphanages applying fluoride to the childrens' teeth, since the water is not fluorinated in the Philippines like it is here in the United States. Not only will this trip be a life-changing experience for Hall, it will give him an insight into the Filipino culture. 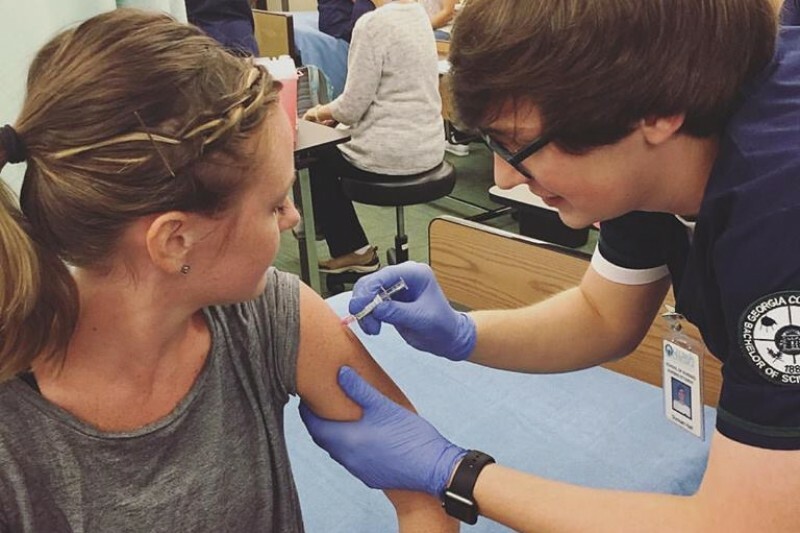 The opportunity to travel abroad as a nursing student will ultimately benefit Hall's journey in nursing all the while fulfilling his desire to help those in need. When asked why he chose nursing as his career, Duncan told us "I got the idea for nursing after my sister had been in the hospital so much with her cancer and my family had been very well taken care of by the nurses there." Spending countless hours in hospitals and Doctor's offices while growing up, Duncan saw firsthand the effects of cancer, as well as the stigma that went along with the disease. To Hall, "It’s a way to help people and take care of them all the while satisfying my interests in the medical field...after graduation, I plan to go on to get an advanced degree as a nurse practitioner or a nurse anesthetist." Thanks to many generous donations from friends and family Duncan has been able to raise just a little over 10% of the total cost of the trip, but he needs 2500.00 more before he departs next Friday, May 26th. If you would like to find out more and how you can help Duncan get to the Philippines, click HERE.